Cognex’s “big brother” to the popular TruCheck FlexHite DPM, the TruCheck DPM Tower boasts a 60mm wide field of view, laser focus indicator, and height that accommodate a part as tall as 12 inches. Same lighting angles as the TruCheck 2D DPM and TruCheck FlexHite DPM: 45, 30 and 90-degree. It is truly a bigger version of the TruCheck FlexHite DPM. Adjust the working distance of this versatile verifier for any part. 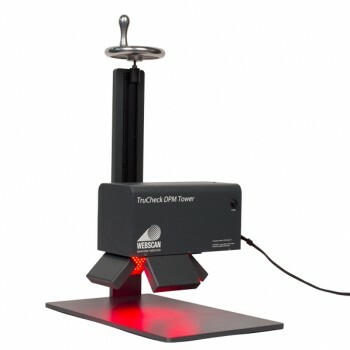 Focus adjustment is guided by Webscan’s proprietary laser indicator. 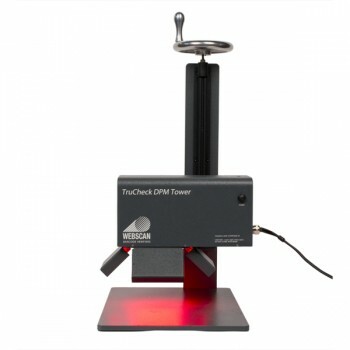 With its large field of view and ability to verify 1D and 2D symbols with x-dimensions as small as 7.5mil, the TruCheck DPM Tower™ can handle your most demanding barcode verification challenges. Not just for direct part marks: a choice of 45-degree lighting for ISO 15415 or AIM DPM-2006/ISO TR29158 (45Q, 30 or 90-degree) makes it perfect for virtually any direct part marking application, including dot peen and laser etched UID symbols. But that’s not all. 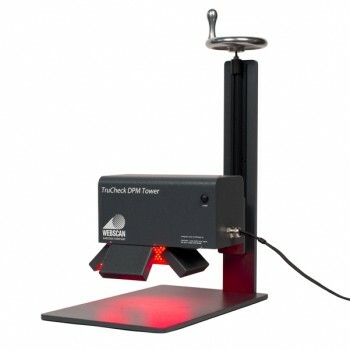 The adjustable height of this system makes it perfect for verifying barcodes, whether they are 1D or 2D when they are recessed or otherwise hard to reach with other verifiers. Simply place your part under the camera head and adjust the height with the manual turn wheel while the software detects the laser positioning indicator for perfect focus automatically!